Sri Lanka Army has sped up the Sinhala colonization process that is being carried out pervasively in the Northern province, resulting in major changes to the social landscape and the culture in the areas. One Sri Lankan Defense Ministry website Army.lk has updated a new report on a visit made by the Army Commander Lieutenant General Daya Ratnayake to several areas in the Wanni last Thursday to oversee the operations carried out by Army personnel where vast acres of land that were owned by Tamil families for generations have now been handed over to Sinhala families, forming ‘new’ villages. The housing and other infrastructure facilities in these villages are being provided to the resettled Sinhalese families by the Sri Lanka army. One such area that was formerly a Tamil village known as Kokachankulam located in Vavunia North has been renamed as Nandimitragama – named after one of the ten giants, who according to legends helped King Dutugemunu fight King Elara and emerge victorious. 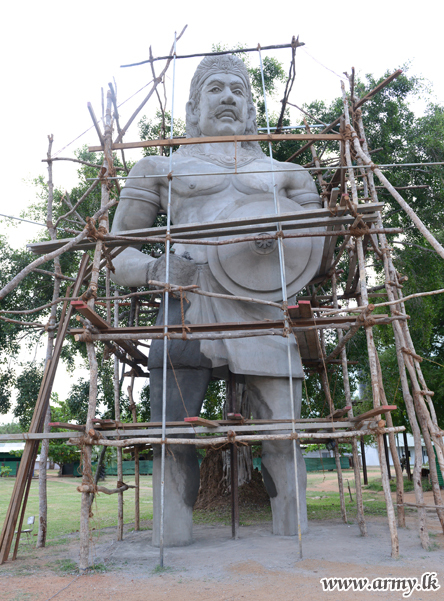 The news report on the Army website states that a massive statute of the Nandimithra giant is also being erected in the village as part of the constructions that is carried out in the area. Similar projects are being carried out in several areas in the Northern province including Vadithalathiu and Padaviya.